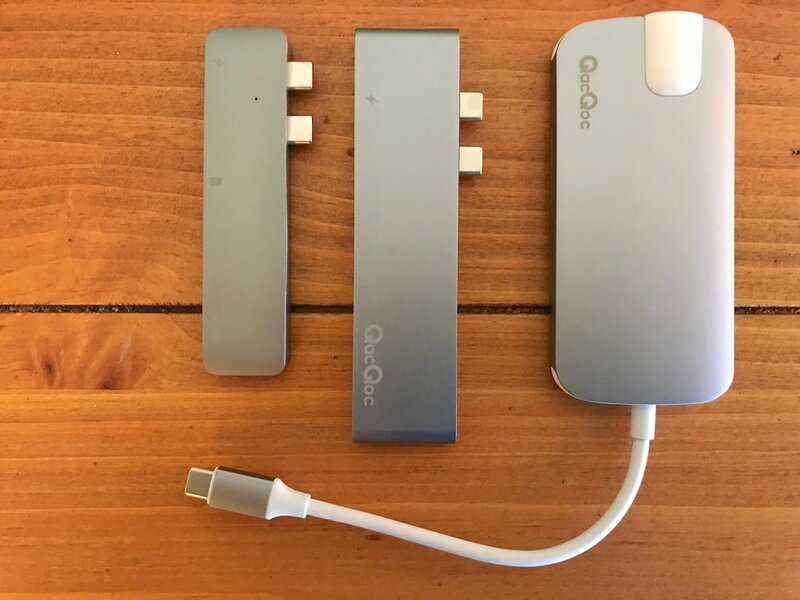 I’d never heard of Chinese accessory manufacturer QacQoc before, but a look at Amazon showed that the company’s surprisingly low-cost MacBook Pro USB-C hubs had garnered some pretty good reviews from buyers. As a result, I decided to try out three of the company’s USB-C hubs as a service to those who have a MacBook Pro and would like a hub that won’t break the bank. We’ll start with the least expensive and move on up the cost scale. If all you need is a way to plug in and charge your MacBook Pro while working, hook up two USB 3.0 devices, read and write SDHC or micro-SDHC cards, and have one Thunderbolt 3 40 Gbps port available, then the GN28A is a low-cost and compact way to accomplish your needs. The GN28A comes in space gray or silver to match your MacBook Pro, and it actually comes with a small leather carry case to protect the dual USB-C plugs from damage in transit. The GN28A is designed to plug into the USB-C ports on the left side of the MacBook Pro, and when it is secure attached a small white LED glows to tell you it’s powered up and ready to use. One of the Thunderbolt 3 ports is marked with a “lightning bolt” signifying that it’s used to plug in the AC adapter for charging. Note that you can plug it in “upside down” on the right side of the MacBook Pro as well — there’s a second white LED to designate powered-up status. However, when plugged in the right side of the laptop the top of the GN28A does not sit flush with the top of the MacBook Pro like it does when attached to the left side. In my testing, the Thunderbolt 3 port, two USB 3.0 ports, and the SDHC and micro-SDHC readers worked as promised, and the MacBook charged perfectly through the passthrough charging port. My only complaint is cosmetic — the GN28A isn’t an exact match for Apple’s Space Gray. That personally doesn’t bother me, but I know that it will definitely bug some people. The company also warns that this hub will not work with a case or cover on the MacBook Pro, cannot handle external hard drives greater than 2TB in size, and does not support the Apple external SuperDrive. For $60, the GN28A is a great companion for those who bought the MacBook Pro and need extra ports, passthrough charging and a card reader, but who don’t want to spend an arm and a leg for a “name brand” hub and adapter. Perhaps you don’t want a hub that takes up both ports on one side of your MacBook Pro. That’s where the GN30H comes in handy. This hub plugs into one of the ports on your MacBook Pro and has a short cable that leads from the laptop to the hub. The hub is packed! One one side are three USB 3.0 ports and an HDMI port capable of providing 4K 30Hz video output. On one end is a Gigabit Ethernet port and a USB-C port. That USB-C port can be used for passthrough charging; it’s not marked as such with the traditional “lightning bolt” icon, which might cause some buyersconcern. When plugged into the MacBook Pro, one end of the GN30H glows blue to designate connectivity. The card readers, Gigabit Ethernet port, HDMI port, and USB 3.0 ports all worked as advertised. QacQoc warns that the USB 3.0 ports do not provide enough power to work with Apple’s external SuperDrive. There’s also a note that the HDMI port doesn’t work with some Dell monitors, and that the device gets warm when charging (40°C/104°F). Compared to the other two hubs, the GN30H seems quite large. For those who want the most compact hub, one of the other two hubs will serve you better. The GN30H would be best for someone who needs extra USB 3.0 ports, Ethernet, or card readers, but doesn’t require additional USB-C / Thunderbolt 3 ports. GN28K: not visible - HDMI port on left end. From left, USB-C/Thunderbolt 3 port, 2 USB 3.0 ports, USB-C port, card readers. Of the three hubs we’re looking at today, I personally thought the QacQoc GN28K fit my needs the best. While it has the same two USB-C / Thunderbolt 3 and two USB 3.0 ports and the same card readers as the GN28A, it also adds an HDMI port for video output. Like the GN28A, this model comes in either space gray or silver to match your MacBook Pro (although the space gray is oh-so-slightly different from Apple’s finish). It’s slightly thicker, so it does not sit flush with the top of the MacBook Pro like the GN28A does. The white LED the indicates connectivity is moved from the top to the “port side” of the hub, meaning that you have to lean over to see if you’re plugged in properly. One of the two ports is marked with the “lightning bolt” charging icon, and the rest of the ports are marked on the bottom of the device although you most likely will know what they are just by looking at them. And we’re three for three — all of the ports and card readers worked as they should when tested. I also used the HDMI port to check video out to an HDTV and that worked fine. QacQoc notes on Amazon that the main “powered” USB-C port can either be used to charge the MacBook Pro with passthrough from the AC adapter or it can be used to plug in a USB-C to HDMI adapter (not included) for a second video out. As with the GN28A, the company also warns that this hub will not work with a case or cover on the MacBook Pro, cannot handle external hard drives greater than 2TB in size, and does not support the Apple external SuperDrive. Please note that all links to Amazon pages in this review are Amazon Associate links. Your purchase of one of the devices will provide compensation to Apple World Today and helps to support the site.